Designed to offer a hip, modern lounge ambience, the space also provides what Celebrity guests said they wanted most in an Internet café -- easy access to the Internet, inspiring classes and new products. (2) Retail Space: This area offers cruisers the opportunity to see and try out the latest MacBooks, iPods and accessories, as well as purchase those products. (3) Enrichment/Entertainment Center: As part of the line's “Celebrity Life” series of enrichment and entertainment options, Celebrity will offer new courses in the iLounge do-it-yourself photo books, movie editing and web design, through programs including iPhoto, iMovie, iDVD and iWeb. 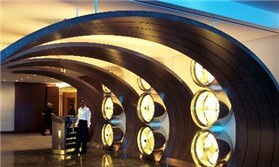 Certified staff will offer guests tips on Mac or iPod usage. “Our new Celebrity iLounge is a direct outgrowth of our ‘Designed for you’ brand platform, and our commitment to listen to our guests and offer experiences and programs expressly designed for them,” said Celebrity’s President and CEO Dan Hanrahan. The Celebrity iLounge also will be a feature of Celebrity Silhouette, which launches in 2011, and a fifth Solstice-class ship, setting sail in 2012. The Solstice-class ships of Celebrity are consumer favorites, and with its newest vessel, Celebrity Silhouette has revamped the open-air Lawn Club area. SouthernCruising.com was onboard the ship during its christening cruise in July 2011. Check out our photos of this latest and greatest update to the popular Solstice-class series. 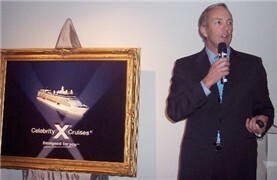 Celebrity Cruises, which sails from many southern U.S. ports, unveiled its new brand strategy in New York. SouthernCruising.com was present as Dan Hanrahan, Celebrity's president and CEO, revealed the new brand tag line -- "Designed for You" -- and unveiled a new logo and promotional plans. Celebrity also plans to "Solsticize" its Millennium-class ships, starting with Constellation. Join us for an update. Editor Susan J. Young overnighted onboard the new 122,000-ton Celebrity Solstice in late September 2008 as she readied to sail from Meyer Werft in Papenburg, Germany, up the River Eems prior to sea trials. President Dan Hanrahan took Young and other journalists on a tour of this new, largest-ever Celebrity ship, which is now sailing in the winter from Port Everglades, FL. Come along for our photos and impressions of the new Celebrity Solstice!